Release number two on Shadeleaf Music, Thatmanmonkz’s hot new imprint, and boy does he provide the goods on this one. 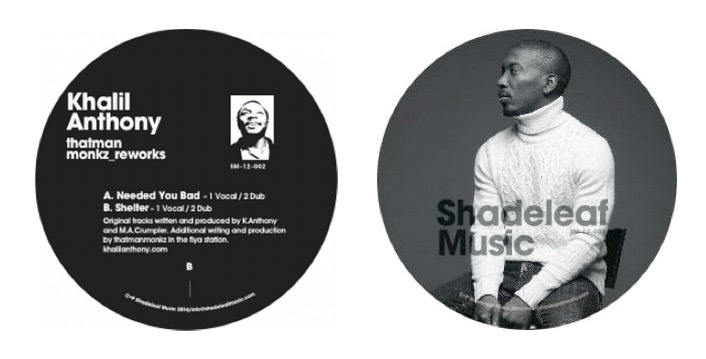 The 12′ features 4 amazing reworks and dubs of 2 stunning Khalil Anthony tracks. Here we get further proof that Shadeleaf Music is fast becoming a reliable source of raw organic soulful wax, the way we like it. We’ve picked Needed you Bad – Thatmanmonkz Dub as tune of the day because it’s been destroying dance floors for us since it’s first spin, but hold tight as all four tracks are killers. Real music for real people.. Following their seriously strong debut release from rising talent & label mastermind That Man Monkz we have an absolutely superb duo of reworks (and dubs) from the man himself & Chicago polymath Khalil Anthony, an author, musician and celebrated collaborator in theatre productions, including emmy award winning broadband series entitled, itsallinyourhands.com. As well as penning and performing on two acclaimed LP’s, his writing can also be seen in Marc Bamuthi Josephs highly acclaimed hip-hop theatre production, Word Becomes Flesh. Khalil Anthony has toured for the last three years with the Living Word Project, and Word Becomes Flesh and also serves as the Educational Director for the tour. This long distance collaboration offers us a totally unique and seriously fresh project for Shadeleaf Music. Needed You Bad taken from his latest LP ‘Train’, fuses blues samples, a raw, spoken word / sung hymn to yearning & that, by now trademark roughed up & heavy duty T.M.M MPC rhythm work. For the dub, we get an irresistible rump-shaker with a killer KDJesque bassline, custom made to make you move ! On the flip Shelter delves into the worldly vibes of Osunlade, as the mesmerising jazz elements and unique vocals once again combine to conjur up a deadly voodoo funk-out. Again, the dub stripes back those key elements to their raw essence and deftly works the groove in the time honoured tradition of the legendary NY club space of the same name – strictly for the foot-working crew !